If you're looking for inexpensive and simple wall art projects, look no further than this fun craft idea. 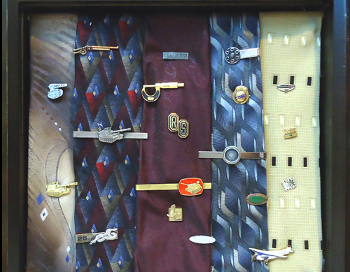 Framed Tie Wall Art can be hung in any room and makes a great gift for father's Day. Show dad you care with a creative DIY decor craft. Lay out your ties in layers that look good to you and are 12″ wide. Lay packing tape over them to keep them from moving. Cut excess fabric about 2″ beyond the tape. Remove the frame insert and lay over your ties. Make all the adjustments so the ties fit into the insert. Use the packing tape to hold the position of the bottom end below where the the frame stops. Measure 3/8″ down from the top edge of the insert and mark the center. Use a small block of wood inside the insert as you drill a hole on the mark. Repeat at opposite ends on two of the outside edges. The idea is to slide the dowels in place at the top and bottom to wrap the ends of the layered ties around. Measure and cut the dowels to fit in the holes and cut them so they don’t extend outside of the insert. Stand the insert upside down and lay the top of the layered ties, back side facing up, inside with the excess toward you. Slide the dowel in over the ties. Lay 2 strips of Fabric Fusion tape on the ties (on either side of the dowel. Remove the tape backing and fold the excess over the dowel and press securely in place. Repeat for the bottom, making sure to pull the ties tight when securing. Add the tie tacks , pins and bars to the front. Slide the insert into the frame and place the back of the frame on to secure it. What a unique idea. My boy friend is a lawyer and he tends to save the ties he was wearing when he won big cases. This would make a great way to display them. His birthday is coming so this will be a very different gift. Thank you for sharing this inspired idea.